Day 11 of Digital Sisterhood Month (#DSMonth) was celebrated at Teaism, a woman-owned tea house located at Penn Quarter in Washington, D.C. Cups of ginger zing tea and dark chocolate salty oatmeal cookies kept the DC She Writers Meet Up energized on a cold Tuesday night. Valerie Trammel, a new D.C. resident and communications and marketing professional (formerly the Director of Cultural Affairs for the City of Wilmington, Delaware) and Ananda Leeke, #DSMonth founder, discussed their creative journeys, favorite books, social media tools for writers and communications professionals, 2012 lessons learned, 2013 plans, and The Power of Memoir by Linda Joy Myers. They also met and chatted with a creative meet up group of women and men knitters who organized themselves via Twitter. The night ended with a ride home provided by Uber DC courtesy of digital sister Mazzie, a DC knitter. Visit SheWrites.com to learn more about the women writers community. Since June 2010, Digital Sisterhood Network founder Ananda Leeke has been organizing and hosting quarterly She Writers Meet Ups for Washington, DC area women writers at Teaism, a local woman-owned cafe, in an effort to build community and encourage peer networking. 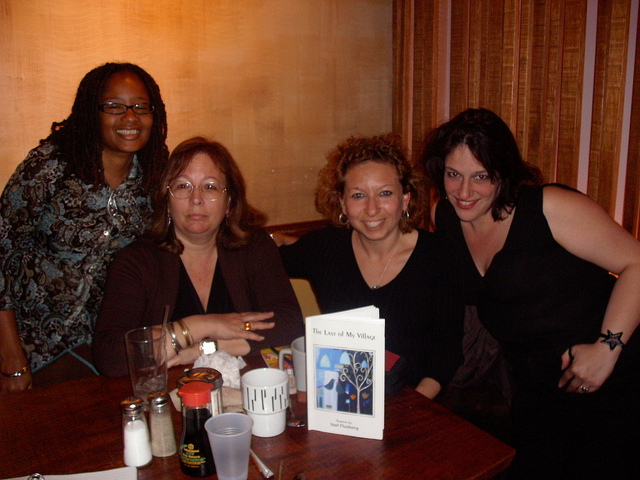 Click on the links below to read blog posts (they include videos, audio blogs, and photos) from the three 2010 DC She Writers Meet Up. Ananda discovered SheWrites.com, a vibrant online community of women writers, while sitting next to SheWrites.com co-founder Kamy Wicoff in a workshop session at the BlogHer conference held in August 2009. 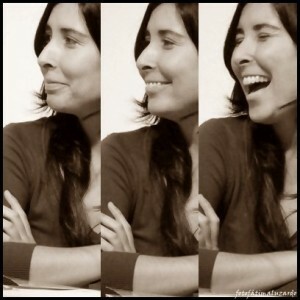 At first glance, Ananda fell head over heels in love with SheWrites.com and has been an active member ever since. 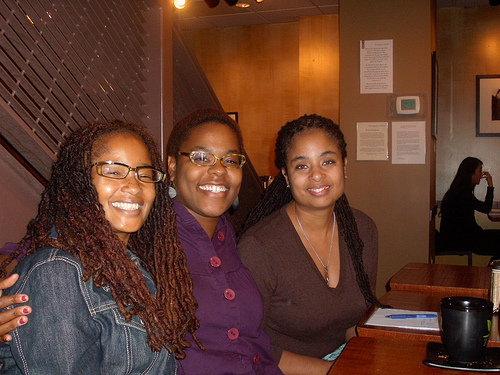 In 2011, the Digital Sisterhood Network adopted the DC She Writers Meet Up as one of its community building initiatives and began sponsoring quarterly meetings. DC poet Yael Flusberg was the featured guest at the March 29th Spring Meet Up. The June 29th Summer Meet Up will celebrate SheWrites.com’ second anniversary on June 29 at 6:30 pm at Teaism, 400 8th Street, NW, Washington, DC. Click here for more details. The featured guest is Ada Vilageliu Diaz, a poet, writer, teacher, and Howard University scholar. Ada’s poetry has been published in Beltway Poetry Quarterly and in Al pie de la casa blanca: Poetas hispanos de Washington, D.C. For more information, visit www.adavilageliu.com. Follow her on Twitter @latinaafricana. Additional meet ups will be held at Teaism on September 29, 2011, November 29, 2011, March 29, 2012, and June 29, 2012. All meet ups will be held from 6:30 pm to 8:00 pm in the lower level of Teaism. The Digital Sisterhood Network sponsored the DC She Writers Spring Meet Up on March 29 at Teaism, a woman-owned tea cafe in Washington, DC. The group shared six-word memoirs about feminism as ice breakers (they have been edited for this post). See below. feminist sheroes: bella. velvet. shirley. gloria. Poet Yael Flusberg was the featured guest. She read excerpts from her new chapbook The Last of My Village and shared insights on writing her book with writers Nancy McCormick, Amy Melrose, and Ananda Leeke. Watch the videos of Yael below. Click here to see more photos from the event. FYI: The DC SheWriters Meet Up is a part of SheWrites.com, an online community for women writers. The Digital Sisterhood Network is hosting meet ups from 6:30 pm to 8:00 pm at Teaism, 400 8th Street, NW, Washington, DC on June 29, September 29, and November 29. Click here to learn more about the meet ups. DC She Writes Spring Meet Up on March 29, 6:30pm@Teaism – Poet Yael Flusberg is featured guest. Join other Washington, DC-area (DC/MD/VA) She Writers for a spring meet up at Teaism, a woman-owned business, (Penn Quarter location), 400 8th Street, NW, Washington, DC (located on the corner of 8th and D Streets NW; visible from the Archives/Navy Memorial metro stop – green/yellow lines). The group will meet on the lower level. Click here to review the menu. The group will share six-word memoirs about feminism as ice breakers. The event will feature a book reading by Yael Flusberg, author of The Last of My Village (a fabulous poetry chap book). One lucky person will receive a free copy of Yael’s book. Teaism is an Asian-inspired teahouse that infuses the cultures of tea and the ideals of teaism with the informality and casualness of America. It offers Bento boxes from Japan, curries from Thailand, and tandoor breads from India. Mark your calendar for the June 29th meet up (second anniversary of She Writes) at Teaism from 6:30 pm to 8:00 pm. If you have questions, please contact Ananda Leeke (www.anandaleeke.com), DC SW Meet Up organizer, on kiamshaleeke@yahoo.com.